Two nights ago we had take-out Thai food. 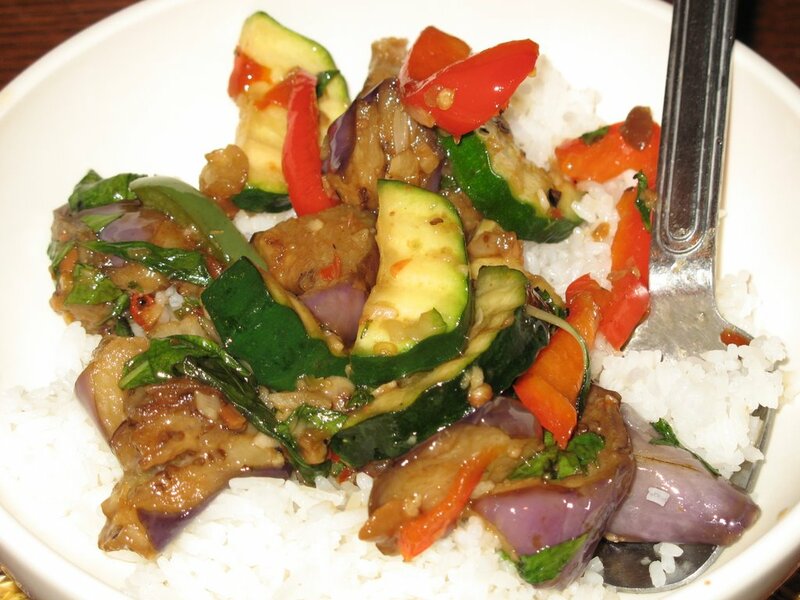 This is a basic veggie saute with black bean sauce. It was okay, but in truth, I don't really like eating out that much. I feel like restaurant food is always so greasy and I just don't like not knowing all that went into it. There are a couple of veg restaurants in town, or just higher-class establishments that I don't feel that way about... but still my favorite thing is to eat homemade food. I'm envious of all of you out there in blogland that have partners/spouses/roommates who help with cooking. I absolutely LOVE eating homemade food that someone else cooked!! :) But in our house, it's either my cooking, or take out (or, spaghetti with store-bought red sauce, Musty's "specialty" - ha ha!). Last night I threw together a tasty little dinner: I cooked up a little half batch of breaded "Breast of Tofu" from Byanna Clark Grogan, sauteed up a couple batches of collards, and had a piece of toast from my beautiful little "No-Knead Loaf." By the way, I updated that last entry with a link to the recipe for this great bread. A tasty and nutritious dinner. I braised the collards with some garlic, salt, and homemade veggie broth... as always... but this time I also added a little dash of the amazing "Apricot Peach Tangerine Balsamic Vinegar" that my friend JJTWH gave me recently!! Boy, I loved it! That stuff is out of this world. As pledged, I bought a few more pomelos at the farmer's market yesterday. Here you can see how much rind it has on it! You know how they say that it takes more calories to digest all the fibers in celery than the actual celery has in it to start with? Well, I think that I practically burned all the calories in the pomelo just trying to peel this giant fella. Still, it's worth it, and I love the flavor. I've got two more. Tonight I made "Stuffed Cabbage Rolls" from La Dolce Vegan for dinner. They were very nice. I pretty much followed the recipe, but I added in about 1/3 c of chopped seitan, and a chopped carrot. Also, I used leftover rice from the fridge instead of bulgar wheat. These were very flavorful and a nice dinner. It made 7 little rolls, which happily fed the two of us. 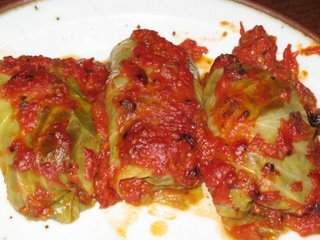 Your cabbage rolls look like they came out quite well--and it would be a nice change from typical meals (at least for me). I know what you mean about eating out. Even at veg restaurants, I end up thinking, "I could have made this myself for 1/4 of the price!" I enjoy eating out from time to time, but mostly I love cooking and controlling what I put in my food. 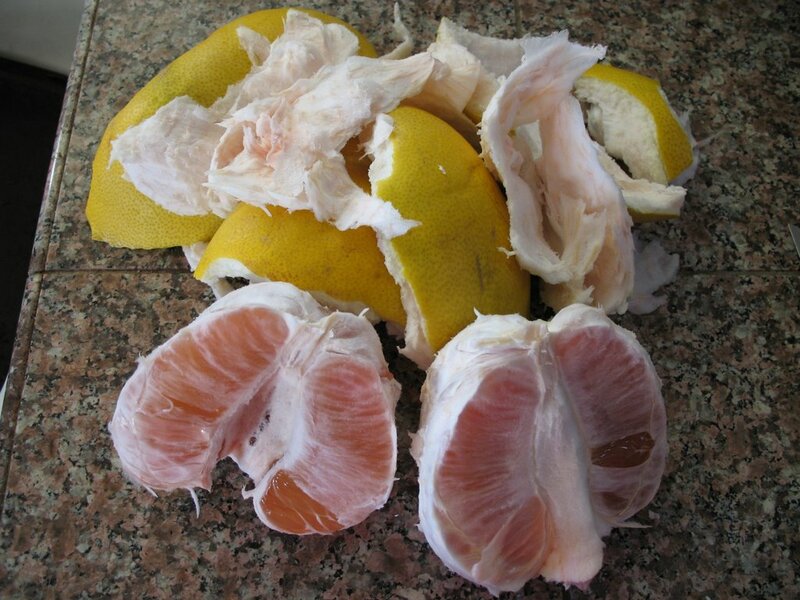 I have a pomelo in my fridge just waiting for me...I know what I am having for a snack today! I agree with you, Amey, about eating out. Either too greasy or doesn't sit well (esp. in the case of those "fake meat" veg. restaurants) or food I could make myself for a fraction of the cost. I esp. don't see the appeal of going out to breakfast -- why wait around for 45 minutes to get a tofu scramble and toast that I could have made and enjoyed at home. 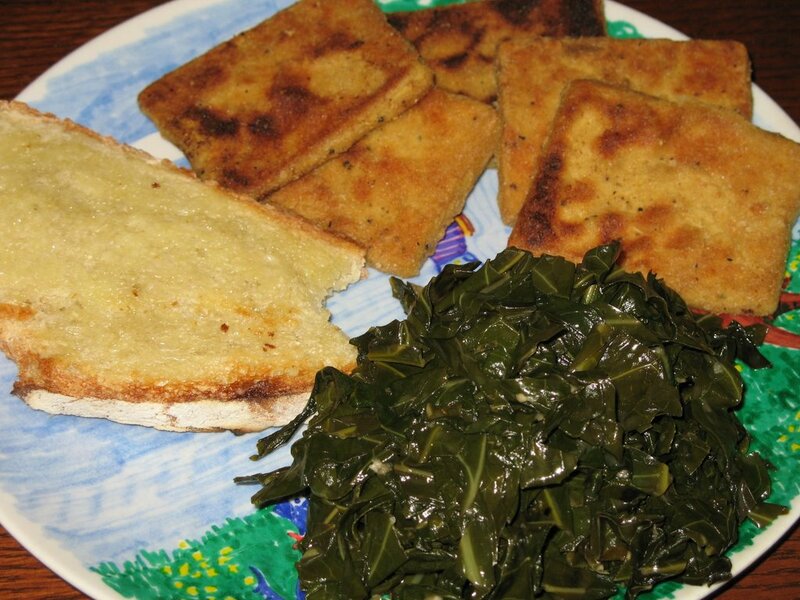 Have you ever thought about doing a monthly vegan potluck? I like the pomelo photo :-) I think I have mentioned this before, but I also really like how you show seasonal fruit and vegetables (and what to do with them) in your blog. I am with you about the restaurant food. I think that a lot of people are uneducated and/or they lie about the ingredients. It's often hard for me to enjoy the meal because I'm fretting over what is in it. Marty's specialty is PB&J. Spaghetti is a step up!!! You should count yourself lucky! My girlfriend and I have a pack that when our husband's both die, we're going to move in together. We both love food and cooking and all the fun/frou frou things our husbands poo poo. I'm with you about restaurant food- in most places, we'd rather not know what's going on in the kitchen! But in a few precious places, you get the sense that your server a) knows what a vegan is and b)actually cares enough to make sure, and those places always leave you with a good feeling. I've never tried stuffed cabbage, but I've always wanted to... when will they invent taste-o-vision monitors for computers?! I have never had a pomelo. Where have I been? Those cabbage rolls look like the one's my Babci used to make. Oh, you are so sweet. Thanks for the cooking generosity! Yeah, the cabbage rolls were quite tasty, and also not too complicated. Also, about eating out, I think something about being vegan, and reading all those labels gradually just makes all think more about what's in our food! Yum! I hope you liked your pomelo! I totally agree about the "fake meat" veg restaurants not sitting well afterwards. Funny that something can be vegan and still not feel right. And I TOTALLY agree about breakfast - all that waiting and waiting!? Craziness. I have thought about doing a vegan potluck, but I really don't know many vegans unfortunately. So I don't know who else would be into it. I'm glad you like the seasonal foods, it's so nice to eat in season. I know just what you mean about worrying about what's in the food. Sometimes it's hard to even enjoy what I'm eating, if I have any vegan-doubts. I love your pact with your girlfriend! ha ha. I also like that you used "frou frou" and "poo poo" in the same sentence! Yes, those few precious placs are so exciting... It really is a great feeling when the server knows and respects what vegan means. Oh, I always love the stories you share about your Babci. What did she put in her stuffed cabbages? I thought they were great! Also - go eat a pomelo!